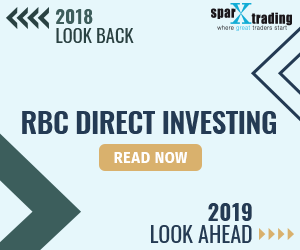 RBC Direct Investing has been working towards improving the functionality, pricing and features of their online trading platform. Early in 2014, they caused a major pricing shift among Canadian discount brokerages by lowering their standard commission pricing to $9.95 per trade. As a bank-owned brokerage, RBC Direct Investing offers the convenience of being able to manage multiple financial products via the RBC online platform. The integration with holders of certain RBC banking plans may enable certain client to be exempt from paying certain account fees at RBC Direct Investing. Another feature about RBC Direct Investing that makes it stand out from its bank-owned online brokerage peers is the community feature. The community section allows comparison with other investors, provides educational support and it contains a moderated forum for asking questions to the community or RBC Direct Investing. if no PAC for combined $100/month. Commission pricing at RBC Direct Investing has become much simpler to understand. The standard equity commission for online trading is now $9.95 per trade regardless of account size or trading activity.For very active traders, in this case clients that make 150 or more trades per quarter, the price per trade drops to $6.95. Options trading is also possible via RBC Direct Investing with the cost per trade at $9.95 + $1.25 per contract. Again, active traders (150+ trades per quarter) benefit from reduced pricing of $6.95 +$1.25 per contract. One of the important points to note is that there is a quarterly fee (called an “Inactivity Fee”) charged to those with balances under $15,000 and there are also several ways to have this fee waived. Clients who deposit at least $100 per month in their RBC Direct Investing account as part of a pre-authorized contribution plan, those who make at least 3 commission-generating trades per quarter, those who have a group RRSP with RBC Direct Investing, those who qualify for the RBC Direct Investing Royal Circle program as well as those who are current student banking package holders (or have been in the past 5 years) and clients who have an RBC VIP banking package can all have their quarterly inactivity fee waived. The account types offered by RBC Direct Investing are similar to many of their peers and can be generally categorized as non-registered and registered. In terms of non-registered accounts, RBC Direct Investing offers cash and margin accounts and registered accounts include TFSAs, RRSPs, RESPs, and RRIFs. With the exception of RESP accounts, all other accounts are dual currency meaning that if you trade in US equities or US dollars there is no required conversion between Canadian and US currency. For registered accounts you cannot use margin or short stocks. Options trading in registered accounts is limited to buying and selling options and writing of covered calls. Although it is not a ‘live’ account, RBC Direct Investing also offers practice accounts to RBC (as well as RBC Direct Investing) clients. The accounts are funded with $100,000 in practice money and individuals can use a cash, margin or RSP configuration to practice with. RBC Direct Investing uses a web browser based platform to execute trades as well as conduct research and manage one’s account. Unlike an active trader platform or a desktop based platform, the web browser based offering is fairly standard. The order entry window requires filling in a number of fields however there are a number of guides and explanations across the window to help users through the process. The charting features are minimal so for those looking at doing in depth comparisons and chart analysis, the Recognia technical analysis tool may help but the overall charting functions are basic. This topic contains 21 replies, has 3 voices, and was last updated by Yaja 2 months, 1 week ago. Stay away from RBC Direct Investing ! I had account with RBC since 7 months and their platform is not that great. Account does not show real time value but 15min delayed. Don’t understand why???. Second if you want customers to trade on your platform but cannot place trade with real time quotes at time of placing an order then it is useless for having such an account. Third their customer service said we are electronic and transfer in-out is faster with brokerage like us but not the same with companies who are manual when I was doing my transfer-in. Now when I was transferring out to another institution their transfer out team is taking the same amount of time. the worst. I traded a stock and made $500, the next day they pulled out my profit and i was told that the stock i traded was restricted.they should have put a restriction on the stock.i tried to get my money back but no way its gonna happen.worst customer service. going back to scotia itrade. Oh my goodness I just recovered my life savings lost to IQOptions scam. I stumbled upon this recovery agent called binaryoptionrefundnowATtutanotaDOTcom With this guys i was able to recover about $235,870 lost to this fake scammers. I tried the police,banks and all but they all taught I was making a fool of myself. It’s funny how binary frauds has expanded without control. I strongly recommend binaryoptionrefundnowATtutanotaDOTcom if you or anyone you know has experienced this fast rising scam. terrible… have just moved my cash and all my investments to RBC..45 minute wait or more at times, if you need to call direct investing. and worse than that, they do not even allow for a trailing stop…great way to lose money…i had always used a trailing stop when i was with scotia i-trade. i will be pulling my assets and going back….i can’t even imagine not providing what other trading platforms provide… i guess this tactic must make RBC more money..never mind the customers protection. My love affair with Royal dates back 2 decades. It took awhile but reason finally won out. I spent $2500 in commissions last year + $1500 in foreign exchange fees. I’m moving my accounts to Interactive Brokers and expect to reduce my commissions by 40% and fx by 95%. I have been using RBC Direct Investing for many years, and just came across this thread. I am surprised at how negative most of the comments are. I am a Canadian living in South Africa since 1981, and also have on-line trading accounts with TD Direct Investing in Luxemburg and Standard Bank Online Trading in South Africa. As it stands currently, the RBC trades are $9.95 per trade in the relevant currency, the TD trades $14.95 for US$ trades, and SBSA trades about US$8.50. In all cases, the prices have dropped over the years due to: 1) competitive pressures; and 2) the realisation that with cheaper fees people trade more and there is the potential for even greater fee income (given that many of the platform’s costs are fixed). As for quality of service, I have not found RBC that bad compared to the other two, remembering that I am half a planet away. I must, however, admit that I am not an active trader. Rather, I try to do weekly rebalancing. My primary service for assessing shares is Validea, which provides reviews of shares on the Canadian, American, and South African markets (www.validea.com, ca.validea.com, sa.validea.com). Interestingly, I am probably the only person subscribed to all three. In terms of website design, the South African site is surprisingly the best. For you it might seem like deepest darkest Africa, but people realised long ago that there would be problems getting qualified back office staff at a reasonable price and there has been a huge investment in technology. Next best is RBC, but my primary concern is access to information, i.e. the charting, research, etc., and much less speed of execution. I can see where people would be frustrated. The worst of the lot is TD in Luxemburg, and there is some arrogance because it is a multi-exchange platform that gives access to 12 markets (I think) and probably as many currencies. It has very little charting and research, and I instead have to rely on Yahoo finance. Note, that one of the issues that I have is the opening of accounts helter skelter due to various regulations. The RBC account was joint with my mother until she past away, otherwise I would not have been able to open it. The TD and SBSA accounts are my own. I find the hassles of opening new accounts on other platforms so tedious that I am willing to put up with the higher charges and poor platforms (beggars cannot be choosers). Will look forward to hearing other people’s feedback. Horrible platform. I switched platforms from another bank and now really regret doing it. There appears to be a big reactionary time delay of around 20 minutes. If you sell at the bidding price you would think your sells would sell almost immediately like they would on my other platform. With this platform you do not feel like you are totally in control. Going back to my other banks platform. Savvy commentary . Coincidentally , if someone needs a DA 5754 , my kids discovered a fillable version here http://goo.gl/kRDj1a. In short, this platform is slow and outdated. Numerous service disruptions have interfered with numerous trades. Poor customer service. I will be going back to TD Waterhouse which I had no problems with. Customer service is absolutely terrible, I had a guy hang up on me after I expressed my thoughts on how they could make their “level 2 trading platform” better. There isn’t even an option for a stop loss sell. I’d stay away, I am in the process of finding another discount broker right now. It is nice having all your banking and investing together under the same roof but their platforms are garbage and they don’t put money into making them better.